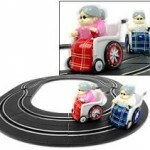 Now you can play Mario Kart in the real world away from your screen and in slot car form. The set includes 2 cars, a transformer, straights, curves, narrowing set, 2 hand controllers, guardrails and spare contact brushes, guide keels plus a track link. 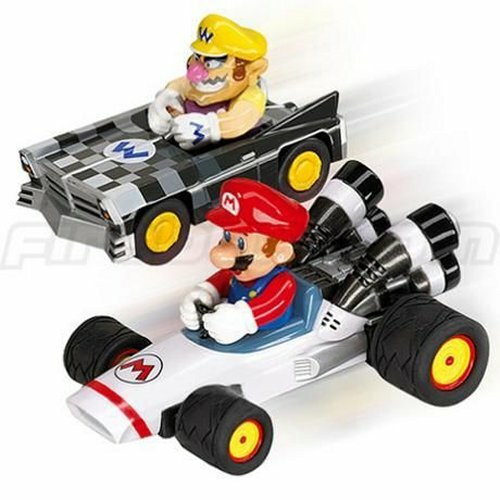 Race Mario’s B-Dasher against Wario’s Brute on twenty feet of track. This should be a fun way to enjoy the classic game in a whole different way. I can only assume that more cars are forthcoming, since racing Mario against Wario could get boring after awhile. Some of us prefer Toad’s well balanced ride. This is a great fun concept. I’m surprised it’s taken them this long to bring it to market. 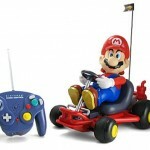 $69.95 brings Mario Kart into the 3-D world. Here’s a Christmas gift worthy of some real estate under your tree.